Imagine a beautiful, baron landscape. One with two moons and extreme conditions. This is the incredible setting for “The Martian.” Now, in the same place, where there is no natural water and where you can’t grow anything, imagine being impaled, barely surviving an extreme storm, and your entire crew left with the only way of getting off the planet. Matt Damon stars in “The Martian,” a new film in which Damon’s character is stranded on Mars and must survived by himself. The film was directed by Ridley Scott and was released on October 2. Kind of a hard thing to live through wouldn’t you say? That is exactly what Mark Watney (Matt Damon) attempts to do. On Mars, Watney is on a mission to collect and study resources with his team. A storm that is larger than originally expected causes the team to leave Mars altogether. Lost in the storm, Watney is left behind, impaled by broken debris, and forced to live on Mars for 868 SOL’s (days on Mars). Although he has enough food for six people, it will not suffice. With extra food brought for Thanksgiving, Watney is forced to try and grow potatoes on “a planet where nothing grows.” Everything goes well for a while, he even gets in contact with Earth, but an unexpected malfunction in the main door to his plants results in an explosion, killing all of his crops. This film is very dramatic, adventurous, and even funny at points. None of it would be possible without the help of this fantastic cast including Jessica Chastain, Kristen Wiig, Jeff Daniels, Michael Pena, Sean Bean, and Kate Mara, amongst many others. 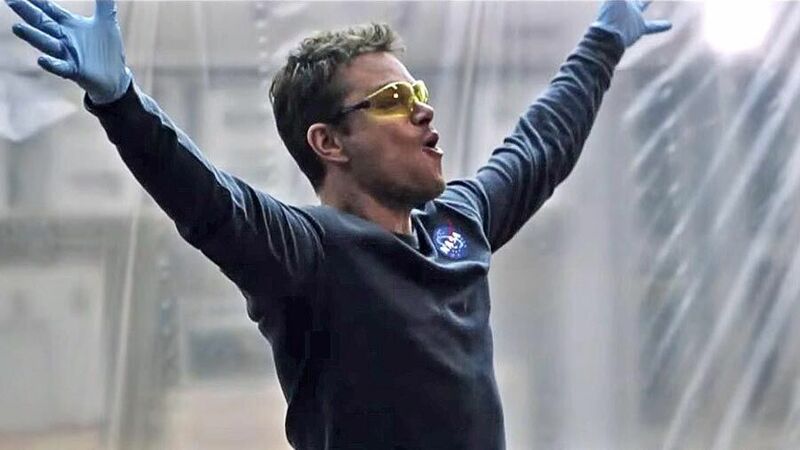 Damon brought a lot of life to the character Watney, nailing the performance that will most likely nominate him and the movie for an Academy Award. Taking a character that could’ve been emotionless, depressed, and silent and making him lively, funny, and eccentric was nothing less than brilliant. The director Sir Ridley Scott brought yet another captivating story to life. Having Scott do a film you expect for it to be dramatic, fairly long, but breathtaking. With other movies like “Robin Hood,” “Prometheus” and Gladiator,” Scott was a perfect fit for such a story. From “Prometheus” you were able to tell how he would approach such an exotic story as this. The key with directing a movie set in space is to make it look real. Scott was smart enough to work with NASA and the Jet Propulsion Laboratory to make sure every little part was realistic. This made the movie much more captivating. Overall great job by Sir Scott on all fronts of this production.